Since January 1 2013, the law regarding serious speeding has changed (Art. 90 SVG). Yesterday Konferenz der Strafverfolgungsbehörden der Schweiz (Conference of the criminal prosecutors) published their new guidlines. Now you know what the state attorney will request, time will show what judges will give. Ordnungsbussenverfahren: Simple fine as defined in 'the official price list (Ordnungsbussenverodnung)' See items 300.x in the linked document. Tagesätze: Monetary fine based on your income. One Tagessatz is approximately a days wage. Grobe Verletzung von Verkehrsregel: Serious infraction of traffic rules Art. 90 Abs 2. SVG. A three month driving ban will be issued. Art. 16c SVG and Federal court ruling BGE 1C_356/2009. Certain offences can be handled with a fixed fine as determined by law (Ordnungsbussengesetz) and ordinance (Ordnungsbussenverordnung). Rules : No one was endangered. Total is not more than CHF 600. There is no plea bargain. There will be no records of any kind. You have 30 days to pay. Beware: If you contest a simple fine or forget to pay within 30 days it goes to the court. The judge is no longer bound to fixed fines given by the Ordnungsbussenverordnung. Additionaly, court fees will incure (see bellow for details). The holder of the car (person who is named in cars paper) has to pay the fine unless he can either name the offender or can prove that the car was used without his consent and there was no negligence by him Art. 6 OBG. For example car was stolen. For tourists: If you get a parking ticket you can pay it at any post office. If you have a rental car this the cheapest you can to, as the rental company will charge you for their "service" to pay the fine for you. Zurich Airport Post Office is open Mon-Fri 7.30am to 9pm and Sat - Sun 8am to 9pm. Locatetd in the Airport Center next to the Migros and Food-Court. One level above Check-in 3. A convction according to Art. 90 Abs. 2 SVG (serious infraction of a traffic rule) will end up in the public criminal record. A conviction according to Art. 90 Abs 1 SVG will only end up in the public record if the fine is more than CHF 5000. Any conviction by a judge will end up in the non public criminal record (Can be seen by judges, police, migration office, or driving license authority). The Law mentions the posibility of confiscating and even selling of the car. Art. 90a SVG and Art. 263 Abs. 1 Lit d CrimPC. Three points have to be fullfiled until that hapens. 3) it is the best mean to deter the offender from any future traffic infraction. Normally, a license suspension is considered as a good enough meassure. If the car is sold by the authority the court can decide for what the resulting profit will be used for. Additionaly, the car can be seized to secure the payments of any possible, fines, fees, and other costs which may incure. This will most likely apply and happen in a case where a person with foreign domicile was caugth speeding. The fine is only part of the total cost that will incur. There are also court fees and fees for driving bans and warnings! If traffic infraction which can not resolved with a simple fine, or you contest/do not pay the simple fine, the case will go to the judge. Any ruling by a judge has to be paid by the losing party. The court fee depends on the Canton, and court. And the possible range is CHF 80 up to 2000. The document also says if a case is especially simple or complicated the fee shall be lowered or raised respectively. If you are unhappy with your court fee you can challenge them. But further charges may occur if you loose. Anything that cannot be handled with a simple fine may lead to at least a warning or if more serious to a license suspension. Art. 16 Abs 2 SVG. Be prepared to get a second letter (witha a second bill) after you received the judges ruling. Because, the decision if a warning/license suspension is issued is not made by the judge. This decision is made by the authority at the Strassenverkehrsamt / Service Auto of your residence Canton at a later stage based on the judges ruling and the specific circumstances of the case. There are certain minimum driving bans which can not be shorter by law and federal court rulings. But, the ban can also be longer than the minimum. A warning/driving ban is not for free. The Strassenverkehrsamt / Service Auto will charge you a fee for their service! 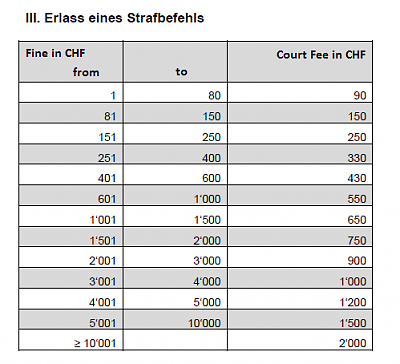 The fees for Canton of Zurich Strassenverkehrsamt can be seen on its website. The fees for Canton of Zug can be seen in this PDF. 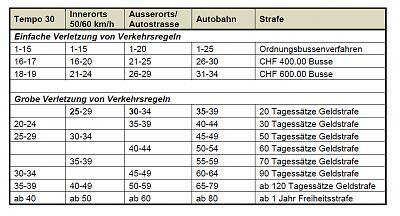 As nearly always in Switzerland: Depending on your Canton your millage may vary. Last edited by aSwissInTheUS; 15.08.2015 at 22:31. Reason: 1) Added court and administatrative fees. 2) Added confiscation of the car. Just wanted to say thanks for translating as well as posting the thumbnails. Saves us all a lot of time. Just glad I will never get caught doing 240KPH in a 120KPH since the car just about get up to 120KPH with a tail wind and down a hill! I was flashed 15km over in a 50kmh zone on 29th December and got 120chf fine. I got off lightly reading this. I didn't realize just how hefty the penalties are so will definitely be more cautious now. Thanks for posting. The law says a minimum of 12 months jail. plus a ban, plus car seizure. Before this became law the punishments were already much higher than Germany and Britain. A few eccentrics managed to collect masses of signatures and it then became a law! I used to drive reasonably fast, maybe 140 Km/hr on the autobahn, but after a 1 month and later a 3 month ban, I changed my ways. 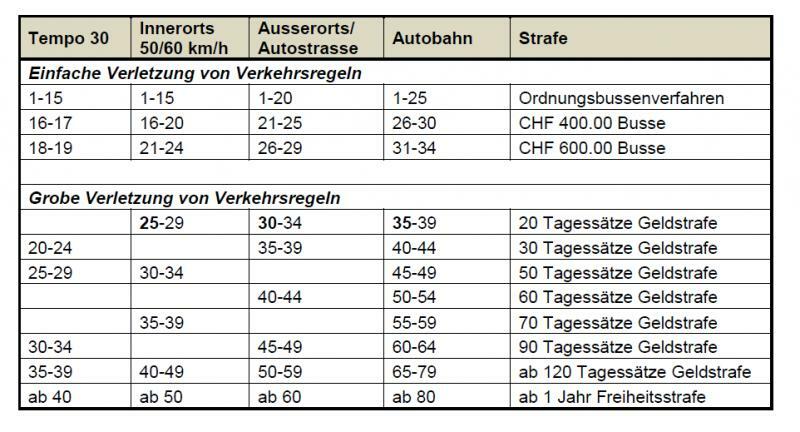 Then last week I received a CHF 160 fine in the post and luckily I was only driving at the "correct speed" on a country road and just did not see the 60 Km/hr sign post, or I would have been in deep trouble. Last edited by Sbrinz; 12.02.2013 at 00:42. Apparently so. Check out the link to the Blick calculator from Blaze above. What is apparently so? That they would use her hubby's income, or that it's a loophole for stay-at-home-moms? The calculator doesn't make it 100% clear one way or the other. well, I think if you put in 0 for Einkommen you get = as the fine, however, I agree, I don't know if they mean household or personal income! Yup... it isn't clear. I saw it on another website - where family income would be calculated into the fine if non-earning person was caught. I have to run now - but will look when I return. Don't quote me on this, but I think it would be calculated based on your husband's income - ie. your household income. I'm pretty sure there are no loopholes. Am glad the "no questions asked - right of way on zebra stripes" has been lifted. Have you got a link to that bit, please? I couldn't find it. The law says that pedestrians still have the priority but cannot just cross suddenly without indication. So if you see someone who obviously wants to cross you have to give way and let them cross. Yes, obviously. But the turn and dash into the street days are over.... well, for the most people. Still some nitwits out there that abuse their right as pedestrians. Thus the new campaign "pedestrians are to make eye contact with the driver before crossing".